At the end of a fairly weak year for documentaries vying for critical enshrinement, crossover popularity, and vindicating awards, Waltz With Bashir arrives on the dual strength of its generic uniqueness. It can boast the distinction of being one of a very few “animated documentaries” and of bearing weighty subject matter: Israeli filmmaker Ari Folman’s search into his repressed experience fighting in Israel’s war against Lebanon. This seems to be a perfect storm of a film, both visually novel (and therefore “groundbreaking”) and thematically serious. But rather than remove all doubt of leading the pack with cutting-edge innovation and audience-pleasing accessibility, Waltz raises more questions about its intent than it probably means to. The movie’s aesthetic and narrative confusion are as much products of a muddled, if just barely successful, approach as it is of Folman’s search among the ruins of his memory. Haunted by a couple of hazy fragments from his time serving in Israel’s Lebanon campaign, Folman interviews the men with whom he fought alongside in order to regain the horrific period of his life he has unconsciously repressed. He also speaks with others who bore witness to atrocities perpetrated by the Christian Phalangists against Palestinian refugees with the unwitting assistance of the Israelis. Animation renders memories — and, sometimes, fantasies — appropriately unreal, a reflection of one interviewee’s explanation that fake memories can seem true and of another’s that disassociative memory are previous experiences as if seen through a camera, slightly removed. Waltz’s animation was created from hybrid processes including Flash and 3D, but the images look strikingly like those of rotoscoping, a technique that’s had a resurgence (and overexposure) ever since Richard Linklater’s Waking Life married it to scenes of hallucinatory oneiric states in 2001. It certainly works conceptually and even meta-cinematically in calling into question the ontological status of what can be categorized as “documentary.” Yet on a moment-to-moment basis — the foundation of “animation” — the movements of characters in Waltz, whether walking, talking, or doing anything at all, look distractingly stilted, jerky, and stiff. Heads turns on necks like pivoting machines and faces convey little but a static blankness, even if the purposefully flattened backdrops achieve a suitable spatial disorientation. Unable to capture the nuances of, say, a shell-shocked soldier’s countenance, the film works best in the service of broad, bold images and colors, such as a dream of Folman’s friend who imagines floating away from his comrades stationed on a soon-to-be destroyed “party boat” on a beautiful naked giantess, or the scorched yellow of a bombed-out urban landscape that greets Folman’s younger self as he rises from the water, one of his few intact memories for which he tries to discover a context. 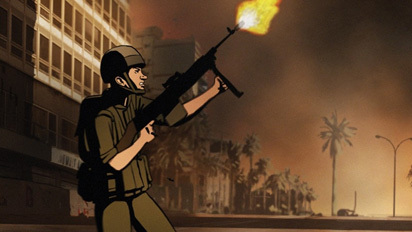 But these flights of fancy are also responsible for Waltz With Bashir’s major setback: Folman’s depictions of the horror of combat fail to diverge much from the war genre’s classic schizophrenic intentions. Where he captures small details that exemplify the monotony, stupidity, and lack of agency that make combat a thankless slog punctuated by bursts of violence, he often falls back on “beautiful” images that may very well speak to a trooper’s heightened subjectivity but also offer eye candy more concerned with visual elegance than the tragedy contained therein. When a platoon moving through the jungle is ambushed by a child with a rocket launcher, the action gets scored to the Goldberg Variations, the tinkling of piano keys ironically counterpointing slow motion, balletic carnage as soldiers hit the ground like crumpling dolls. (There’s also an unfortunate rocket’s-eye view of a projectile’s journey toward a tank, a kinetic cliché of our post-Matrix cinema of thrilling, vicarious violence, also seen earlier in the film in a bullet’s eye view. No excuses.) The same music is used again when a possessed Israeli machine-gunist runs into the middle of a sniper-beset Lebanon street where his comrades have taken cover by the side of the road. Conceivably in service to some unnameable power, the machine-gunner picks off the snipers while dodging bullets with dancer-like contortions of his body. In both cases, the latter of which gives the film its title, the effect is entrancing and yet in opposition to Folman’s own feelings about the heat of battle. “[War’s] nothing like you’ve seen in American movies,” he states in the film's press notes. “No glam, no glory. Just very young men going nowhere, shooting at no one they know, getting shot by no one they know, then going home and trying to forget. Sometimes they can. Most of the time they cannot.” The stark succinctness of this statement finds little realization in Waltz With Bashir. Folman seems conscious of this, because the end of his film veers away from wonderment — or, to be more generous, astonishment — to portray a nightmare simply as a nightmare. A solemn, funereal treatment is given to the Israeli forces’ unknowing abetting of the Christian Phalangist slaughter of innocent Palestinians (by shooting flares to help illuminate their prey at night) and the unsuccessful attempt by several outraged officers to relate news of the atrocities to military commander Ariel Sharon, shown as either unconcerned or complicit. At one point, a window grate in the foreground glides over an officer placing a call to Sharon in the background, simulating a panning shot while also giving the impression of darkened shadows passing over a troubled observer to genocide. After an interviewee compares his actions to that of a Nazi, and Folman’s untethered memory of a crowd of wailing women is finally given clarifying context, Waltz With Bashir can no longer sustain the fantasia of animation and cuts to the raw video footage of these women crying over their dead families. The footage runs for a few minutes accompanied by a slow, lone drumbeat, and then the credits roll. For an Academy Award entry, it’s a fairly shocking ending, offering no reassurance about either the essential goodness of mankind — the Israelis who spoke out about what they saw are hardly regarded as a glimmer of hope in the overwhelming darkness — or, since the film refuses to end with Folman’s musings on what it all means to him, the resolution of personally traumatic memories. While it’s tempting to dismiss this conclusion as Waltz With Bashir’s last-ditch effort to capitalize on tragedy after a feature film’s worth of dreamlike and expressionistic renderings aestheticizing war, it’s impossible not to view the film in retrospect from the point of view of the final images we see. The vagaries of memory suddenly cohere into something meaningful, and what’s revealed is not only the blunt impact of that meaning but how the process leading up to it is full of traps that are entirely manmade because that meaning can be so hard to bear.